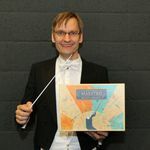 Designer of the Board Game Maestro Ensemble & Symphony. Also desgined a Maestro Quartet and a dice game: Maestro Fanfare. Living in The Netherlands. Profession: safety engenieer.